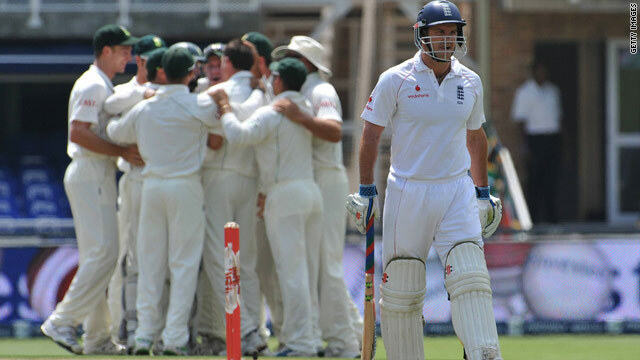 England captain Andrew Strauss cuts a dejected figure as South Africa fast bowler Dale Steyn is mobbed by his teammates. Dale Steyn took five wickets as South Africa dismissed England for 180 to take the upper hand at stumps on day one of the final Test. Steyn finished with five for 59 and Morkel claimed three for 39 while Ryan McLaren and Jacques Kallis both finished with a wicket apiece. South Africa negotiated a tricky final period and will resume again on day two with the hosts 29 without loss. (CNN) -- Dale Steyn and Morne Morkel shared eight wickets between them as South Africa dismissed England for 180 to take the upper hand at the close of play on day one of the final Test. England captain Andrew Strauss, who chose to bat first in humid conditions at the Wanderers on Thursday, was out to the very first ball of the day when he fell to a stunning catch from Hashim Amla at short-leg off the bowling of Steyn. Jonathan Trott quickly followed him back to the pavilion for five when he fell to the final ball of the second over from Morkel as Amla took a superb one-handed catch. Kevin Pietersen made seven before he miscued a pull shot off Morkel and presented an easy catch to Wayne Parnell mid-on, and Alastair Cook was given out lbw by umpire Tony Hill - and third official Daryl Harper, after a video appeal referral. A fifth-wicket stand of 76 either side of lunch between England's Cape Town saviors Paul Collingwood and Ian Bell offered the only notable resistance as the tourists were bowled out in 47.5 overs. The wicket has got a lot in it. Steyn collected his third wicket when Matt Prior gloved the ball to South Africa wicketkeeper Mark Boucher as England crawled to 136 for seven. Graeme Swann was able to add valuable runs to the total as he made 27 at a run a ball and put on a useful partnerships worth 44 runs for the final three wickets, including 25 for the 10th with James Anderson. Steyn finished with five for 59 and Morkel claimed three for 39 while McLaren and Jacques Kallis both finished with a wicket apiece. England's attempts to make early inroads into the South Africa batting line-up were largely frustrated as first rain and then bad light saw the players leave the field early. South Africa captain Graeme Smith (12 not out) and Ashwell Prince (15no) both negotiated a tricky period and will resume again on day two with the hosts 29 without loss. England lead the four-match series 1-0 having won the second Test sandwiched in between dramatic last-day draws and, despite England's current position in the match, Collingwood believes the Test is still in the balance. "The lads will be a little bit disappointed," Collingwood told reporters at the close of play in in Johannesburg. "But we won't know what a par score is until South Africa have batted. The wicket has certainly got a lot in it. There was good carry and the ball was swinging all the time."